“Sam hasn't been as automatic from three-point range as we had hoped early in the season,” Middleton coach Kevin Bavery said. 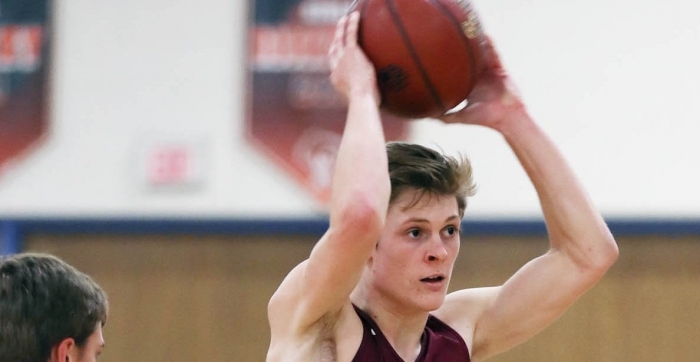 “He grew so much athletically from his junior to senior year by spending quality time in the MHS strength and functional fitness program, so we started emphasizing to him to get in tune with all phases of the game and not put so much pressure on himself to hunt that three-point shot. Senior guard Jack Boyle added 15 points and made 9-of-11 free throws, including all six in the second half as West was forced to foul late. Close also made 8-of-9 free throws — including 7-of-8 in the second half — and the Cardinals were 24-of-29 overall from the charity stripe (82.8%). Senior guard Chandon Thomas added seven points and seven rebounds, while senior center Keegan Severn added four points and two blocked shots. Middleton shot 44% for the game and held West to 29% shooting. The Cardinals also had 28 points in the paint vs. 20 for the Regents. Middleton’s defense was terrific in the first half and the Cardinals built a 25-17 lead at the break. Close had 10 first half points and Boyle added seven. Senior guard Casey Hellenbrand also relieved Boyle when he picked up two fouls and helped handle West's full court pressure. Hellenbrand also made a pair of first half free throws. “We kept a large squad again this year, 17 players in all,” Bavery said. “It's hard to balance playing time and achieve our best possible performance on game night, and it clearly is a season long process. West closed within 40-39 midway through the second half, but Middleton answered with a 12-1 run to take a commanding 52-40 lead. The Cardinals then slammed the door on the Regents by making 18-of-22 free throws in the second half. Just six days earlier, West defeated top-ranked Madison East, 96-80. So understandably, Bavery and the Cardinals were giddy with the win. “We're starting to figure out that our strength clearly is inside-out,” Bavery said. “Getting touches in the paint through post feeds, drives in to the lane, passes to cutters, and offensive rebounds are big keys for us. Then when it comes back outside we're getting better spacing and more time to release the three-pointer. We're reacting better and hitting on offensive concepts more and more without us having to call them from the bench, which is a big step in the right direction. WEST — Jones 1 1-5 3, Reed 1 2-5 4, McCray 5 3-4 14, Armwald 7 1-2 16, Thompson 1 1-2 3, Barry 1 0-0 3, Brooks 1 0-0 2, Richmond 0 1-2 1, Neugebauer 1 0-0 2. Totals 18 9-20 48. MIDDLETON — Thomas 2 3-5 7, Hellenbrand 0 2-2 2, Close 9 8-9 28, Boyle 3 9-11 15, Severn 2 0-0 4, Deptula 1 2-2 4, Pa. Van Buren 1 0-0 2. Totals 18 24-29 62. Three-point goals — MW 3 (McCray 1, Armwald 1, Barry 1), MID 2 (Close 2). Total fouls — MID 23, MW 23. Fouled out — Reed, McCray.